Cracked & settling concrete. Concrete settlement is common and can cause significant problems like trip hazards, pooling water and cracks in the concrete. Mudjacking (also referred to as slabjacking, grout pumping, slab leveling, etc.) has been the common method used for lifting sinking concrete and is still widely used by contractors for concrete slab restoration. Mudjacking can be an effective solution, but in some cases may only be temporary. While mudjacking and polyurethane injection achieve similar results, the process and overall performance and lifespan of the two products are very different. If you have a sinking concrete slab that needs to be repaired, contact Quality 1st Basements today to discuss your needs and get a free on-site estimate. Pressure grouting. Mudjacking involves pumping a slurry of Portland cement and soil under high pressure through holes drilled into a concrete slab. Mudjacking uses a mixture of sand, water and Portland cement which helps solidify the material. The mortar-based mixture, or "slurry," is pumped through large holes in the concrete using hydraulic pressure, which lifts the sunken slab. While mudjacking is a common option for repair, there are several problems which make it a less desirable alternative. The mixture takes several days to cure before any weight can be placed on it. The mixture is very heavy, weighing an average of 100-150 lbs. per cubic foot and can add additional unwanted weight, potentially making the problem worse. While mudjacking is more affordable and less invasive than concrete replacement, the material can eventually erode and wash out, causing the slab to eventually settle again. Rather than using a mixture of concrete and mud, polyurethane concrete raising utilizes environmentally-safe polymer foam that is injected through penny-size holes in the concrete. Through a chemical reaction the high-density foam expands to stabilize the loose soils and lift the sunken concrete. After approximately 15 minutes, the polyurethane material is fully cured and can be driven on or walked on. The polyurethane weighs only about 2 lbs. per cubic foot, which doesn’t add any additional weight to the soil. Polyurethane foam is an inert, stable product that is made from 100% recycled materials. 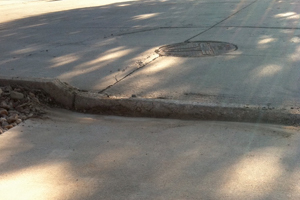 It is impervious to moisture and decay ensuring that your concrete repair will last. The expansive polymers allow lifting of heavier loads such as stoops and slab foundations. 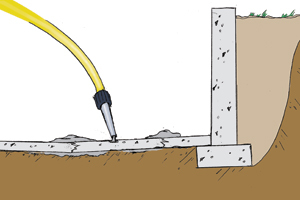 At Quality 1st Basements, we use the proven, engineered PolyLevel® System to stabilize and re-level foundation slabs and exterior concrete in Staten Island, Manhattan, Astoria, Flushing, Elmhurst, Ridgewood, Queens and surrounding areas in New York. If you'd like a cost quote on mudjacking for your home or any of our other foundation services, contact us today!